CREAZ from Body Attack stands for anhydrous creatine. Content is sufficient for use according to our recommendation for 333 day(s). CREAZ from Body Attack stands for anhydrous creatine. It is part of the newest creatine form, stronger than conventional forms presently available on the market. This is possible through a cutting-edge production process. This takes place by dissociationg the water molecule from the creatine-monohydrate, so the creatine can be utilised in a free and highly concenrated form for the first time. The new and free creatine form from Body Attack. 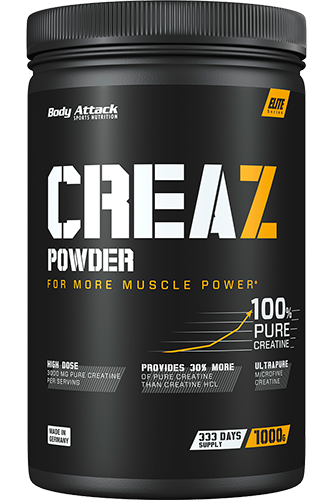 CREAZ provides the athlete with 100% pure creatine for intensive muscle training. The Z in CREAZ stands for the "Zero Monohydrate” formula (anhydrous creatine). Significantly more effective: Up to 30% more creatine makes it into your muscles. The training muscles respond better to this form of creatine as they can only utilise this form effectively for the build-up of adenosine triphosphate (ATP). CREAZ from Body Attack leads to a faster charge of muscle creatine, through which the increase in high-speed strength performance in strength and sprint training is accelerated. Muscles are more resilient to an intensive workout, making it easier to reach training goals. Daily consumption of Body Attack CREAZ can restore diphosphate deposits, diminished after just a few intensive repetitions, in mere seconds back into triphosphate. CREAZ is a new and stronger creatine product which, according to scientific studies improves performance in short and intensive workouts. This means that daily consumption of 3g creatine for a number of weeks´leads to more repetitions and increased training weights. But this is not all: the speed of interval-runs can also be increased. Ambitious athletes and professional sportsmen are sure to be impressed by the 100 percent pure and uncombined CREAZ from Body Attack. Creatine increases physical performance in high-speed strength training whilst short-bursts of intensive physical activity. CREAZ can be found on the Cologne List®. Only tested dietary supplements with a minimal risk of doping are placed on this list. For whom is CREAZ suitable? For experienced recreational and performance athletes who want to supply their muscles with sufficient creatine over longer periods of time. For strength and endurance athletes who want to complete more repetitions and gain more strength during their workout. With which products can CREAZ from Body Attack be suitably combined? With Body Attack Carbo Loader, in order to provide the body and the muscles with sufficient energy before and after workouts. With the high value Body Attack Extreme ISO Whey, which contributes to the development and maintenance of muscle mass, especially after intensive workouts.